Choose from ready-made templates to personalize and give to your loved ones. Eid al-Fitr is a religious holiday celebrated by Muslims marking the end of the monthlong fast of Ramadan. It is observed when the first new moon is sighted, which leads to the festival being celebrated on different days in different parts of the world. It’s a time for Muslims to come together and celebrate with families and friends. Share feasts and greet your loved ones a happy and blessed Eid with beautiful, heartfelt cards from Canva. Choose from colorful and ready-made greeting cards and personalize as little or as much as you want. With or without design experience, our suite of intuitive design tools will help you create a card your friends and family will be very happy to receive! 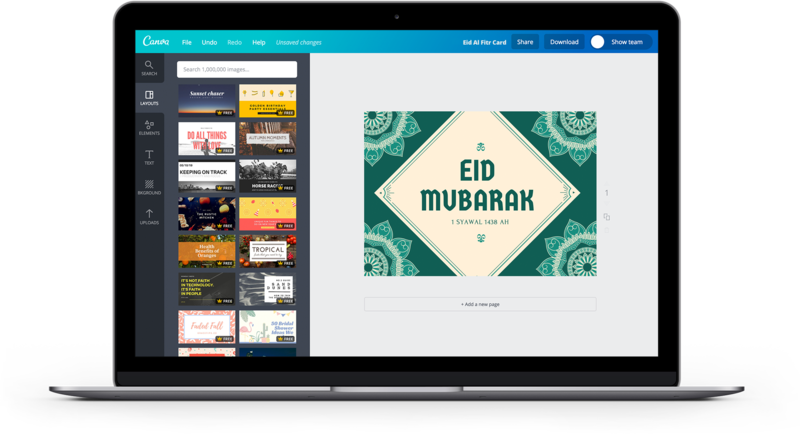 Create a new Canva account to get started with your own Eid al-Fitr card design. Browse from hundreds of inspired and ready-made layouts appropriately designed for this blessed and joyous occasion. With our intuitive design tools at hand, personalize your card according to your heart’s desire! Change the color scheme, adjust the sizes of the design elements or move them around. If you are greeting loved ones overseas where Eid is known more popularly as Hari Raya Idul Fitri or Lebaran, changing your well wishes is as easy as highlighting the default text and adding your own charming alternatives. In our editor, select the font and typography design that best conveys the spirit of your message. You don’t have to look for images outside of Canva for your Eid al-Fitr greeting cards as we have already picked out photos and illustrations you might want to use. If you wish to customize your card with more images, just head over to the search bar found near the left hand-side of your Canva editor, type in a few choice keywords, then click enter. When you’ve found the right image, simply click or drag it where you want it to go on your design. There are plenty of free images to choose from while premium images cost only $1 for each one-time use. Once you are done personalizing, it’s time to print your cards and hand them over to your friends and family. You can download your designs as a PDF file and print them at home or send them straight to Canva Print. We’ll bring your cards to life with gorgeous paper and finish options and deliver them right to your doorstep. Would you rather save on post? Send your cards as a digital file directly on Canva by going to the Share button located on the same editor toolbar. You can send your card to your loved ones’ via their email addresses or connect your Facebook and Twitter account and share it directly to your friends and followers. Can I still edit the card I made for next year? Yes! The Eid al-Fitr cards and other designs you create on Canva are saved in your account. Feel free to access and personalize your saved cards further using the same design interface and drag-and-drop simplicity! You can also create and edit designs on your mobile devices by downloading Canva’s iPhone, iPad and Android apps from the App Store and Google Play for free. There are watermarks on my card. How can I remove them? Can I use my own images? How can I do that? Uploading and using your own images is free in Canva! Click on the Uploads folder and then select the Upload your own images button. You will be able to access your computer for the images you want to use for your card. Your uploaded images are automatically saved in your Uploads folder ready to be used in your other designs.